Also see more recent blog posting: What Do You Expect From The Workshop in Essex? The exposure of Mark Kennedy as an infiltrator of activist groups made headlines early 2011. When confronted Kennedy admitted to having been a spy for seven years. Using the name Mark Stone, he had embedded himself in the environmental movement, the organizing of summit protests, social movement organizing elsewhere in Europe. The Mark Kennedy story is an exemplary case, with the infiltrator as a facilitator, crossing the line towards the role of an agent provocateur. Press coverage was huge resulting in a series of official reviews. However, all of the official reviews neglected the aspects of corporate spying that make out the background of this operation. The Kennedy case reveals the increasingly blurring boundaries between public and private policing and puts the grey area of corporate intelligence in the spotlight. The set of secret units Kennedy used to work for was founded explicitly to satisfy the needs of companies targeted by activists. What is more, the companies involved – such as electricity suppliers and airline companies – also hire former police and intelligence staff with long track records in monitoring activist groups to deal with security issues. The Kennedy case is in no way unique, it is just the latest exposure in a long line of similar stories of intelligence operations in the UK and elsewhere, conducted either by the police or by private contractors. And it will not be the last case. Wikileaks has revealed how private intelligence company Stratfor is keeping monitoring the Yes Men and their campaigns for the survivors of the Bhopal disaster. Closer to home, the Tobacco Control Research Group investigates the tactics of the tobacco industry and its allies to undermine the governments health policies. This workshop aims to address the worrying trend of conjunctions between the state and the corporate world aimed at suppressing critical voices that are indispensable in a democratic society. 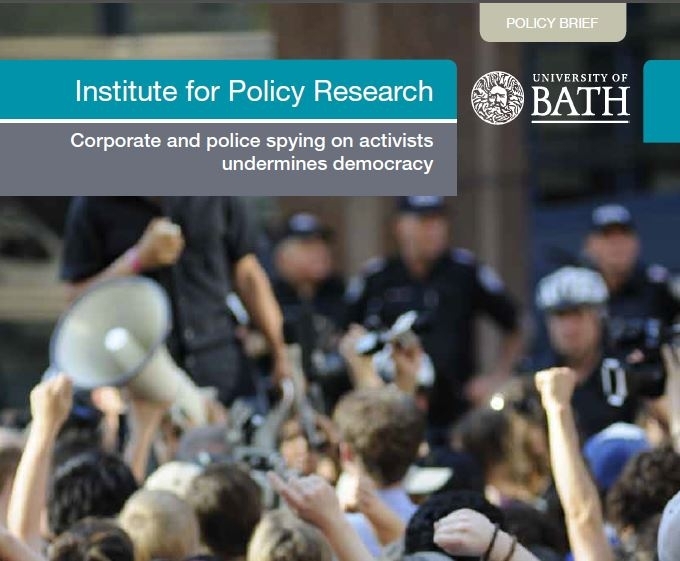 Developing activist intelligence and methods to counter covert corporate strategy as a field of research is inherently difficult, given that the original source material is – almost by definition – hard to access, maybe secret, and often difficult to comprehend. Intelligence operations necessarily take place in secret, under-cover. Data on such operations are confidential by nature, prepared for the client’s ‘eyes-only’. Discovery of proof behind stories and controversies that surface in the media is essential to put the events in perspective and understand the wider context. But new research needs to be initiated too. The importance of the issues at stake calls for a more active role for social scientists, investigative journalists, politicians and NGOs, and others concerned about the role of public protest in society.